Gareth Bale's first half shot took a telling deflection off Fernando in an own goal which divided Real Madrid and Manchester City at the Bernabeu, despite the hosts dominating en route to making it to the European final for a record 14th time. Manchester City were unable to muster even one shot on target throughout the 90 minutes on a warm night in Spain, suffering an early blow as Vincent Kompany limped off with an injury. But, other than Aguero's shot fizzing over the bar late on, it was one way traffic for Los Blancos, as Gareth Bale struck the bar with a header as part of a comprehensive performance from Zidane's men. An ignited cauldron of passion and expectation ahead of kick-off, the Bernabeu certainly set the magnitude of the moment with it all to play for following the goalless first leg. A sea of white shirts flocked towards Manchester City as soon as they kicked off, uplifted by the clamourous attendance. After some early glimpses of potential from the visitors, as Jesus Navas' cross was beaten away by his namesake goalkeeper with the green clad contingent enjoying a fair share of the introductory possession. But warning signs were showing up early from Los Blancos. Isco's cross was a little overpowered to find Jese and the subsequent corner was just caught by Hart after Pepe planted a header towards his direction. 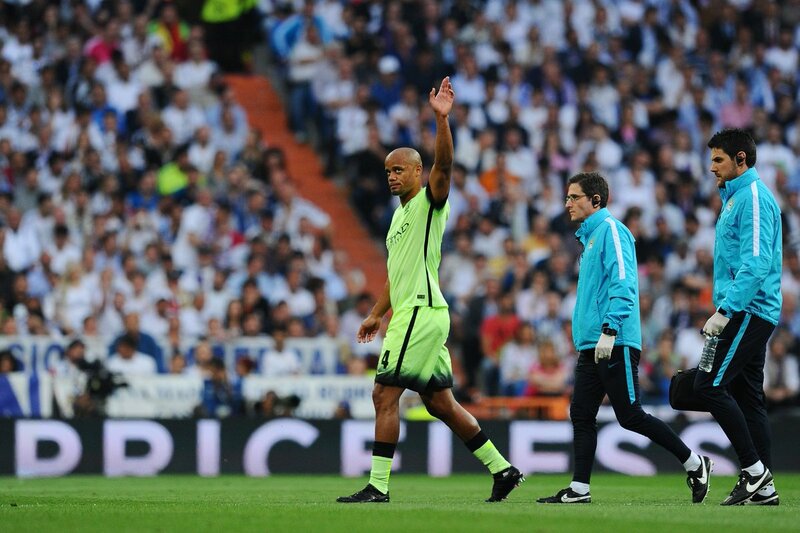 While things remained relatively balanced at this point, an injury to City's crucial captain really changed the tone. Just ten minutes in and the Belgian was forced off for an apparent muscle issue and made way for Eliaquim Mangala. Zidane's squad began to spell blood as they awaited their chance, Marcelo saw his shot blocked while Modric went to ground outside the area after some intricate footwork, although was denied the free kick. But what began to develop as a recurring theme first emerged after 20 minutes on the clock, as Carvajal played it right around the defenders to Gareth Bale on the right area, and from a tough angle he fired across goal, but Fernando, making a challenge, deflected the ball sending it over Joe Hart, clipping off the woodwork and into goal. The Welshman would celebrate although officially it would go down as an own goal. From then on in, Real took the game by the scruff of its neck, awaiting further opportunities to seal their place in the final. Bacary Sagna forced Ronaldo to the ground creating a free kick opportunity from the left which ended in an offside call. Manchester City's attacks were few and far between, with Aguero felled by Ramos to win a free kick that came to nothing before the ball went back to its proverbial owners at this stage, as the white clad players controlled at ease. They did have the ball in the net just a few minutes later, but it was offside after Pepe knocked on Kroos' delivery to his captain. As the first half wore on, Real Madrid were beginning to flex their muscle and began to get more creative with their chance making. Isco found Bale who saw his low effort caught by Joe Hart, and the English keepers work load would only continue after the interval. Before that, though, Fernandinho gave City their closest chance of the game right before the half time stoppages. De Bruyne on the turn set up Fernandinho on the cusp of the box, but the shot just dragged wide and whistled past the post. At the half time whistle, Real Madrid had the lead through a mostly dominant period, however with only one goal to show for it, the job was far from done. Right from the outset of the second half, Real Madrid came at it again with their warning signs. While offside, Ronaldo was thwarted by Mangala at the right when looking to have a go at the near post while Jese's cross fell into the hands of Joe Hart despite the England number 1 slipping as the ball came towards him. Kompany's absence still left a void in the thick of the second half action as Gareth Bale tore through the City defence with one superb pass. Unfortunately for him and his teammates, Cristiano Ronaldo couldn't get a clean connection on the volley with the defenders approaching him. Luka Modric then missed a golden chance to put the game to bed when City's defenders watched on as casual spectators believing he was offside. The Croatian wasn't, but luckily for the visitors, Joe Hart came to the rescue, knocking it out for a corner as he got on to the end of a ball over the top. With Real still alert to stop City from any goalmouth action, typified as Keylor Navas raced all the way out of his box to blast the ball away. There would be more pulse raising moments at the other end when Cristiano Ronaldo flew up in the air to head in a cross but Joe Hart just hung on to it with a swift catch. Chances continued to flood in on the part of Real Madrid, with Ronaldo's shot eventually a tame one before Gareth Bale rattled the woodwork with a bullet off a header at the end of Toni Kroos' corner. Subsequently, Ronaldo re-enacted the "hand of god" incident in some form or another when offside, handing it into the net. But still, City remained in the fight - a fight of which could have been helped had Lucas Vazquez received a red card which was certainly warranted after a foul on Raheem Sterling. Incredibly late to the challenge near the byline on the left, his opponent could continue but on any other day that easily could have seen him been given his marching orders. Sergio Aguero had an ultimately muted game, but the one chance he did conjure up was certainly a frightening one for the Madrid spectators. He let fly from a few yards out the box with the right foot, dipping and troubling Navas, but it landed on the roof of the net. Keylor Navas then needed some treatment after hurting his leg when heading the ball out on a courageous clearance. That would add to the stoppage time allocation, but throughout, Real controlled the ball calmly and City just couldn't get it, Ronaldo won a corner after James couldn't put it away when unmarked in the box, and the referee blew the whistle to end it: Real Madrid were back in the final of Europe's elite club competition, with an all too familiar rival awaiting them. Toothless City fail to show up on big occasion: Manchester City rested all their big players on Sunday's fixture against Southampton - and it showed. That was of course in the hope that they could get one step closer to European success at the Bernabeu, but of course that wasn't to be. Yaya Toure's return was supposed to be an uplifting moment for the squad, but his work rate really summed up his team's malaise: Aguero's late shot was a moment of magic, but too little too late. It's a frustrating moment, since they really didn't threaten and in the end, while it was only one goal, it was far from close. They didn't have the desire to win, they could have done much more and perhaps if they did, they would be packing for Milan. Vázquez lucky to be on the pitch: Lucas Vazquez's challenge on Raheem Sterling was incredibly dangerous and on another day that would have been a stonewall red card. Who knows - that may have tilted the game in favour of the Citizens and its fortunate that the winger didn't get extremely hurt, because that was a high foot on the shin. Perhaps City's lack of desire at the end really made that a moot point. Hart's heroics not enough: Just as the first leg showed, Joe Hart is an imperative instrument to this team. Once again he was there to defy Real Madrid of all their chances, from a Ronaldo header to Modric's attempt at point blank range. The one time he was beaten was perhaps the unluckiest; a wicked deflection off Fernando and into the uppermost corner of the frame. Other than that, the keeper showed his worth, it's a shame many of his other players didn't. Kompany leaves huge void: Vincent Kompany's exit due to injury really became a cue for City to unravel defensively. Without his stability, there were far too many gaps in the back line and while Mangala did well considering the circumstances, Madrid were able to seep through on far too many occasions, and it was all too easy for Carvajal to play it around the defenders and to Bale on the right of the box, where his shot was deflected into goal. Crucial Cristiano: On an attacking standpoint, Cristiano Ronaldo, perhaps as expected, elevated Madrid to a higher level. Even Bale was firing on all cylinders as the forward progressively improved; getting closer with his chances from a scary header to Clichy blocking his shot in the box before the corner and the whistle being blown. Maybe this would have not even been close if he could have played at the Etihad. Atletico are one of the best defences in the world and maybe their biggest challenge now awaits them in the final - if Cristiano is fully fit it promises an incredible battle. Man of the match: Luka Modric, 9.1 — The Croat excelled throughout the game not only catalysing all the counters when Real rushed forward, but making so many important interceptions to break down City's play in the middle of the park. He really did put in a fantastic shift and maybe a holding role is the right way to go about, but Zidane should be satisfied. Casemiro's absence caused some early rifts but Modric patched over it adequately. Yaya Toure: 5.0 — The Ivorian failed to strike a chord and was not really providing the searing force going forward as was expected of him in the pocket of space behind Aguero. Joe Hart: 8.0 — Barring the one goal he conceded which was an unlucky deflection, it was another strong showing on the part of the keeper in the second leg. Cristiano Ronaldo: 7.9 — Cristiano didn't start off the game with a bang but as it progressed he began to see more goalmouth action and threatened. Gareth Bale: 7.9 — He'll probably claim it was a shot, but he could have had a goal officially for himself when he hit the woodwork from Kroos' corner. Sergio Aguero: 6.0 — Other than a late scare, Aguero was unable to get going and summarised more of the City malaise. Sergio Ramos: "We managed to stay united and soak up the pressure to pull it off. We've eliminated a huge team in City. It has taken a lot to get to the final, but we deserve it." Eliaquim Mangala: "There is pride at reaching the last four but we fell to a more experienced team." Cristiano Ronaldo: "We knew that after the goal City would press high to us, but I think we controlled the game, 1-0 was a short result but we are happy and we are in the final." Joe Hart: "We didn't deserve to lose to Real Madrid. They created little chances. We could easily be in the final. But we didn't have that little bit more. Did we do enough to win the game? I don't know." Manuel Pellegrini: "I think neither of the teams deserved to win the game."